By this clause in the will of Brevet Major General George W. Cullum, of the United States Army, colonel of engineers and chief of staff to General Halleck, the Military Academy, of which he was a graduate and at one time superintendent, became the possessor of one of the finest memorial structures in the world. There are two important monuments at West Point, the Battle Monument and the Cullum Memorial. Neither was the gift of the nation. The Battle Monument was built by the subscriptions of the men commemorated, and of their brothers in arms, donated while on the field of battle, while the Memorial Hall was the gift of a graduate of the Military Academy. The monu­ment is dedicated to the memory of the officers and men of the regular army—both graduate and non-graduate; while the Memorial Hall is commemorative of the graduates only, and the very few officers of the institution who were not graduates. This hall, therefore, is distinctly a monument to West Point and all that it stands for, given by a son of the Academy to his brother alumni and their well beloved mother; designed to commemorate their deeds, to preserve their names, and to bear witness to the enduring work of the foremost military school of the age. General Cullum's bequest was form­ally accepted by act of Congress, and provision for the carrying out of its pur­poses was entrusted to a board of trustees, selected from the Academic Board of the institution and headed by the superintendent as chairman ex officio. General James B. Fry, an intimate personal friend of General Cullum, was originally a member of this board, but his early death removed the only member not on the staff of the Academy. It was decided to entrust the work to the firm of McKim, Mead & White, of New York, and it became the special charge of Mr. Stanford White, who made it, with characteristic enthusiasm, a labor of love, and con­tinues to devote time and labor to its memorials without other reward than that derived from pride of work and love of art. Upon the eastern border of the natural terreplein which forms the gen­eral parade of the Military Academy, overhanging a rocky cliff a hundred and eighty feet above the great water high­way of New York, is located the new building. It is severe, almost austere, in its simplicity, and dominates the gray rocks in winter as does the Parthenon on the Acropolis—a challenge to the eye. In summer, the thick foliage frames it in a more idyllic setting, and breaks the severity of its lines. 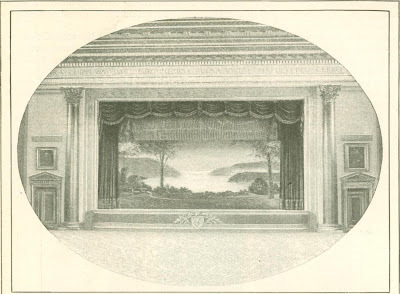 It is a plain, rectangular body of pinkish white —pink Milford granite, having the effect of White marble—divided by slight relief into two wing masses, inclosing on the western front a colonnade of four half engaged Ionic columns supporting Greek entablature. On the river side, square pilasters with plain molded capitals supplant the columns, and be­tween these the wall is pierced by four large rectangular openings which give into a loggia. The details of the Ionic treatment are those of the Erectheum. 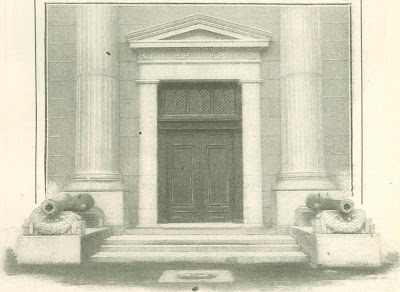 The entrance doorway is a plain pedi­ment, supported by pilasters, inclosing two handsome bronze doors, the steps of which are flanked by two large Spanish guns on massive granite plinths. Just under the architrave the wall is pierced by a continuous line of clerestory win­dows, which light the main hall. Passing the ponderous bronze doors, one enters first a vestibule in white marble, and is confronted by an inscrip­tion in bronze letters applied to the marble on either flank of the inner door, giving the name and military ranks of the donor and a brief description of the functions of the building. Over the doorway are the arms of the Military Academy in bronze. 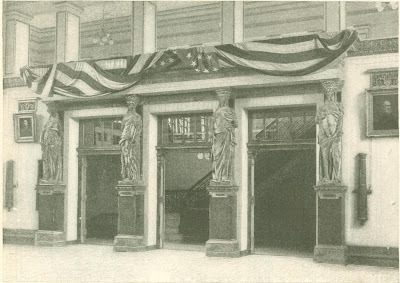 On the marble wall to the right of the vestibule is to be placed a bronze medallion of General Winfield Scott, and, in bronze letters, his eulogy of West Point: "I give it as my fixed opinion that but for our graduated cadets, the war between the United States and Mexico might, and prob­ably would, have lasted some four or five years, with, in the first half, more defeats than victories falling to our share; whereas in less than two campaigns we conquered a great country and a peace without the loss of a single battle or skirmish." In connection with this tribute it is pertinent to recall the testimony of Major General Daniel Butterfield, chief of staff of the Army of the Potomac, also a non-graduate, given in the follow­ing words: "Our country has already forgotten the wonderful and magnificent brain work in organization, efficiency, and staff duty in the Civil War, performed by the graduates of the most complete and perfect educa­tional institution in the world for military training." The inner doors passed, the visitor finds himself in a broad transverse marble corridor, opening at the other end upon the loggia, and intersected by a longitudinal corridor, leading at the south end to a grand double stairway of marble which conducts to the main hall above. On the first floor is an assembly hall for social entertainments, a hand­some reception room, dressing and serv­ice rooms. The great hall on the second floor is a very beautifully proportioned and richly decorated room one hundred and seven feet long and sixty nine feet wide. It is surrounded by a colonnade of twenty two half engaged Corinthian columns, which separate the side walls into ten large panels. The entrance is tripartite, and on the inside shows a fine triptych, the panels of which are separated and en­closed by four caryatides, designed by Martigny, supporting a rich architrave and strongly suggesting the porch of the Erectheum. Above this entrance, across the south end of the hall, extends a screened gallery reached by an exterior stairway. 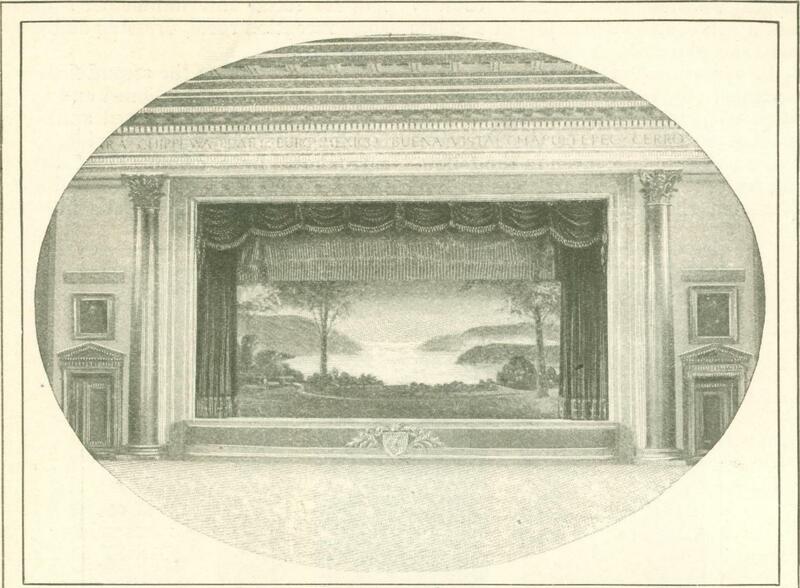 At the north end is a stage, framed in green Bronze touched with gold and draped with crimson silk curtains. The ceiling is a masterpiece of decorative treatment, divided by deep transverse rafters into strongly accent­uated bays, each of which is subdivided into deeply recessed caissons with rosettes, of which there are altogether three hundred and forty in the ceiling. Each rosette holds an electric light. Around the side walls, in the panels, at the height of the eye, is a row of splendidly decorated old guns of green bronze. 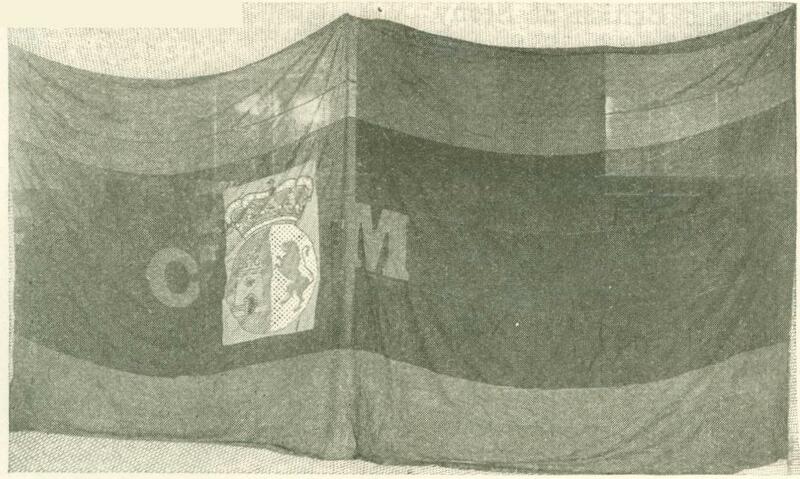 These were captured from the British during the Revolution and from Mexico in '47. Their beautiful hue of verdigris gives the key of the decorative treatment throughout, which is green bronze touched with gold in the high lights, the walls being painted ivory white and the columns treated in veined porphyry. The walls are gradually to be covered with portraits and bronze tablets hold­ing medallions and wreaths. Bronze busts will be disposed on consoles from the columns, while in the corridors and rooms on the first floor is abundant space for similar memorials. In these corridors it is designed to place a series of bronze battle tablets, bearing the name of every battle in which graduates of the Academy have taken part, from 1802, when the Academy was founded, to the present day. They number be­tween three and four hundred, excluding many minor engagements of the Civil War of a size much exceeding that of Las Guasimas. Below the main building and the level of the parade is a basement structure of two stories, containing the rooms and offices of the "Biographical Register" and the executive council of the associa­tion, and more than forty sleeping apartments for the use of the alumni, together with kitchens and rooms for steam heating, ventilating apparatus, and dynamo. The building is handsomely furnished and equipped for banquets and social functions, and is lighted by both gas and electricity. It has already received and is constantly receiving donations, both general and individual. Among the former are the first flag captured on San Juan Hill and others cap­tured in Cuba and Porto Rico; some three hundred regimental standards and guidons of the regular army; a full size copy of the Trumbull portrait of Wash­ington, presented by Gen­eral Daniel Butterfield; the Kimball collection of Wash­ington pictures, and a rep­lica of the Canova bust of Napoleon I. The Spanish and English guns of French manufac­ture, embedded in the walls, are works of art, like most of the Bourbon artillery of two hundred years ago. They bear the arms of Cas­tile and Leon and of the Bourbon Conde house in high relief, with elaborate throatings and ornamental work from muzzle to casco­bel. The dates of the cast­ing of some go back to the days of Mazarin and the Fronde, the plumes of Conde and Turenne, the in­trigues of De Betz and Mme. de Longueville; oth­ers date from Louis XV and the Regency. 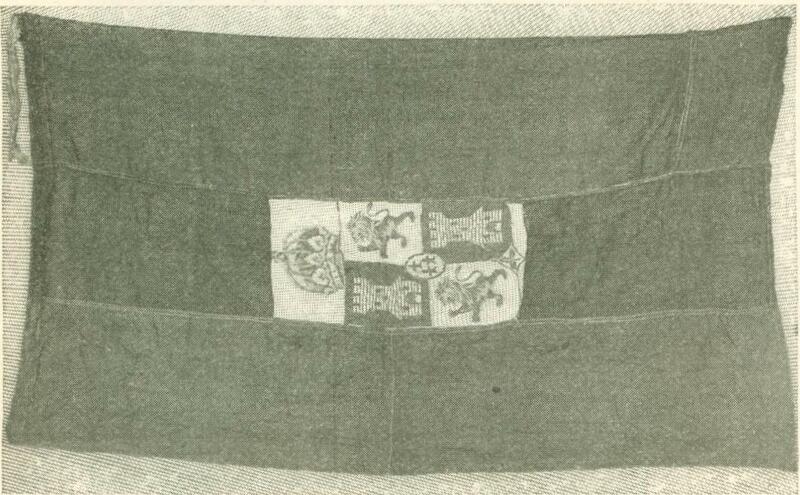 Eight, of French make, were captured from the British at Stony Point, July 16, 1779, and bear the monogram of George III below the fleur de lis. Many of them are named, as "Le Peon," "Gyges," "Le Alonarque," and "El Tonant"; and on scrolls we may read the frequent mot­toes “Ultima Ratio Re-gum," "Vincant Fulmina Regis," and "Violati Ful­mina Regis." Elsewhere are historic guns of a differ­ent epoch—one captured from Burgoyne at Saratoga, another presented by La­fayette to the United States government, and Duncan's and Ringgold's famous Mexican War batteries—while on the four corners of the terrace are four immense bronze bombards cap­tured at Vera Cruz. Around the frieze of the hall, in bronze letters, are the names of our most important battles of the century, beginning with the War of 1812 and ending with the Spanish War of 1898. 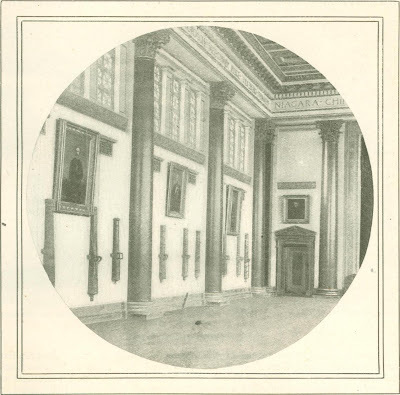 In the ten great panels between the columns, and in the end panels of the hall, between and above the embedded cannon, are to be hung portraits of the great commanders of the Civil War, while below these, forming a continu­ous wainscot between the guns, is to be a broad band of bronze tablets and wreaths bear­ing the names and records of the twenty one army commanders, the thirty seven corps commanders, the fifty or more offi­cers of division, and the nine heads of general staff corps of the Civil War—all graduates of the academy. 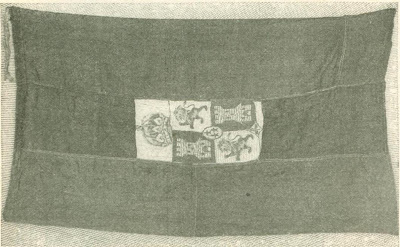 Battle flags and standards; swords and weapons of historic interest; rare prints, maps, and books; medal­lion s, miniatures, busts, bronzes, and carvings bearing re­lation to war; paint­ings of battle scenes or sculptured battle groups are among the objects which can here find appro­priate location. The building hav­ing been but recent­ly completed, now contains but few of the memorials for which it is designed. The great lead­ers, Grant, Sherman, and Sheridan, are without representation, and it is hoped that before long their patriotic country­men will see that they have worthy memorials. Life size bronze statues should commemorate them. Portraits of Thomas, Meade, McClellan, Slocum, Halleck, Sedgwick, Reynolds, W. F. Smith, and some others are, however, in place, and others are expected. The donor of this splendid gift has erected another, monument to his brother graduates, scarcely less remarkable than this—a printed record of their lives, known as "General Cullum's Biographical Register of the Officers and Graduates of the United States Military Academy." This work is so notable and unique as to deserve more than a passing notice. In it he has gathered the succinct records of three thousand three hundred and eighty four lives, from the first graduate of the Military Academy, Joseph G. Swift, 1802, to the last of the class of 1890. The accumulation of biographical material represents a vast amount of patient statistical labor, the reward of which lies only in the accomplishment of a labor of love for the institution to which he devoted the closing years of his life. Not content with the completion of this work between the limits given, he provided by bequest for its permanent growth and issue, and one of the functions of the Memorial Hall is to insure a home for it and a storehouse of data and records for its future issue. I do not know that any other academy has such an institution for embalming the memory of its graduates to all time and for providing a historiography of its own work. The Memorial Hall sup­plements and completes this historical monument by a visible one, wherein the fame of every man who has done honor to his professional mother is proclaimed and perpetuated in painting and in bronze. Indeed, it may be that ulti­mately the name of every graduate who has honorably performed his duty will be inscribed upon tablets of bronze in this great military Walhalla. There is also another record of the careers of the sons of West Point in the publication issued annually by the As­sociation of Graduates, in which a care­ful necrology is published, accompanied in many cases by well executed half tone portraits; so that the career of every West Pointer, no matter how incon­spicuous, is sure of a searching analysis and a lasting record, even though in civil life he escapes the severe scrutiny of military discipline. That the alma mater's watchful super­vision over the career of her sons is a potent influence in their lives cannot be doubted. It supplements and intensi­fies the formative forces of her instruc­tion, and keeps her influence a living force throughout their lives. I doubt if any other educational institution wields so potent a scepter. No human agency can annul the personal equation or create moral fiber, but it can under certain conditions purge and develop, and although now and then defective material will elude her austere tests and, later on, drop from her high moral plane, a study of the " Biographical Register " will show an extraordinary record of integrity and usefulness on the part of this select little army of graduates who have passed through the fire of her discipline and the rigid tests of her academic standards. Up to and including the year 1890, there had been three thousand three hundred and eighty four graduates of the Military Academy during the eighty eight years of its existence, a yearly average of a little more than thirty eight. Out of this little body of soldiers two thousand two hundred and fourteen had sooner or later found civil occupations. For the most part, those graduates who returned to civil life took up professions for which their engineering training peculiarly adapted them. Many became connected in one capacity and another with the various railroads throughout the country many took up architecture and civil engineer­ing, while others obtained positions in the engineering departments of the dif­ferent States. Seventy three officers, after their re­tirement, took charge of universities, colleges, and schools throughout the country, and twenty four studied divinity and became clergymen. It is curious, in view of the fact that so many West Pointers have gone in for politics and have been elected to the Senate and House of Representatives, that only one graduate of the National Academy should have become President of the United States. For the rest, the records of the alumni show that those of the former students at the Military Academy who resigned from the service and did not go to swell the list of authors, editors, man­ufacturers, and lawyers, received politi­cal appointments, ranging all the way from a membership in the cabinet of a President to a billet in the consular service. From the Junior Munsey Magazine, July 1900.